As anyone who is reading this blog knows, I’m not your typical blog. I’m not a stay-at-home mom nor a happy newlywed… heck, I’m not even in a relationship! I’m as far from a fashionista as you could ever imagine and I’ve never traveled internationally. I’m just a typical college student who is excited to explore the world. So why do I blog? Blogging lets me express myself. I’m able to record my thoughts in a way that allows me to share them with the world. As I put pen to paper fingers to keyboard(? ), I am better able to articulate my views. Even though I’ve only had a couple hundred page views as of right now, I know someone out there has read my thoughts. Maybe it was just the post about personal finances or my chocolate and M&M pretzel recipe, or even the lessons I learned as a camp counselor that drew someone’s attention for a few minutes. That doesn’t matter to me. Somewhere, someone can relate to my posts. Blogging connects me with others. Although I don’t have any true followers of my own, I love reading others’ blogs. My personal favorites include: A Preppy State of Mind, A Touch of Class, A SoCal Story, Shenanigans Rose, Living in Yellow, and Southern Belle Soul, Mountain Bride Heart. What connects me with these lovely ladies (other than we are all female)? Blogging. Some of these blogs tell the stories of their lives, others talk about fashion, interior design, and DIY projects. Anyway, that’s enough of why I blog. 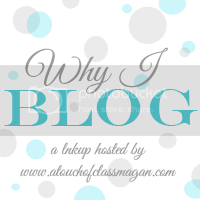 If you want to share the reasons that you blog, then join the linkup hosted by Magan over at A Touch of Class.